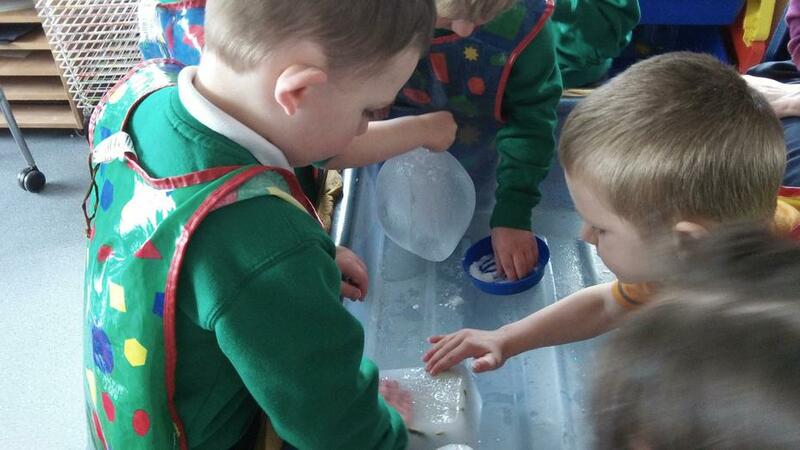 We added ice blocks and ice balloons to our water tray to see how ice behaves. 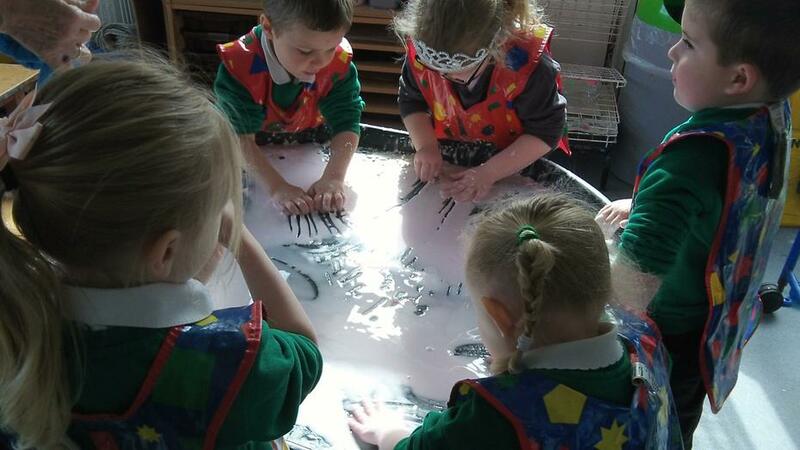 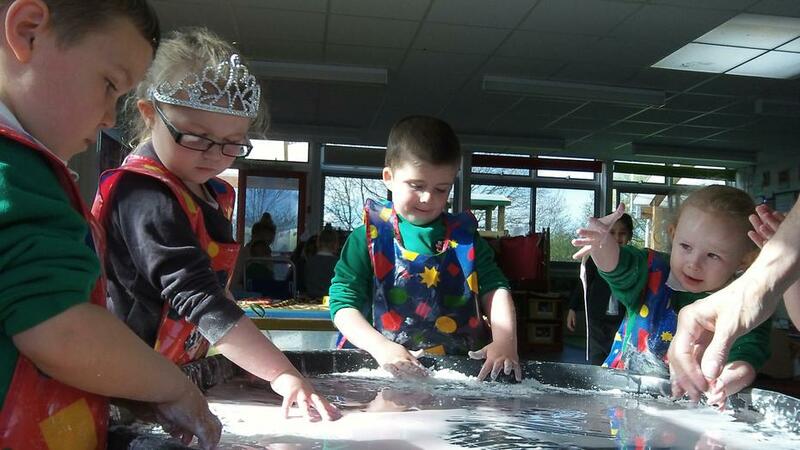 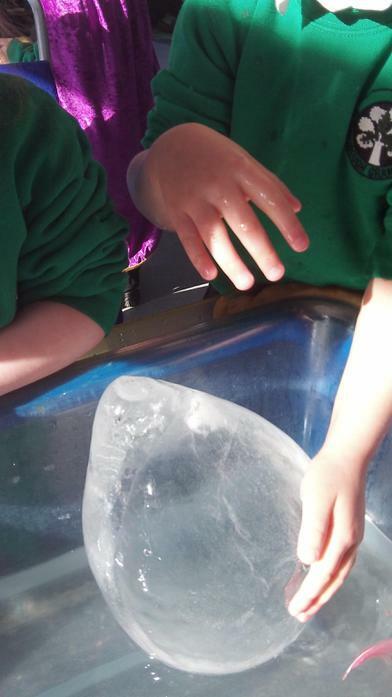 We encouraged the children to explore the ice by moving their hands over it. 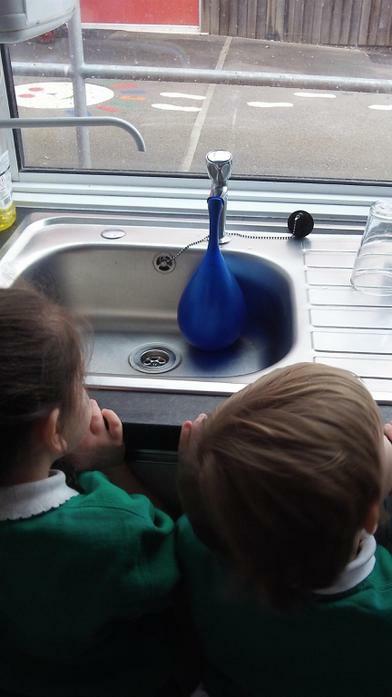 We put hot water bottles out for them to compare temperatures. 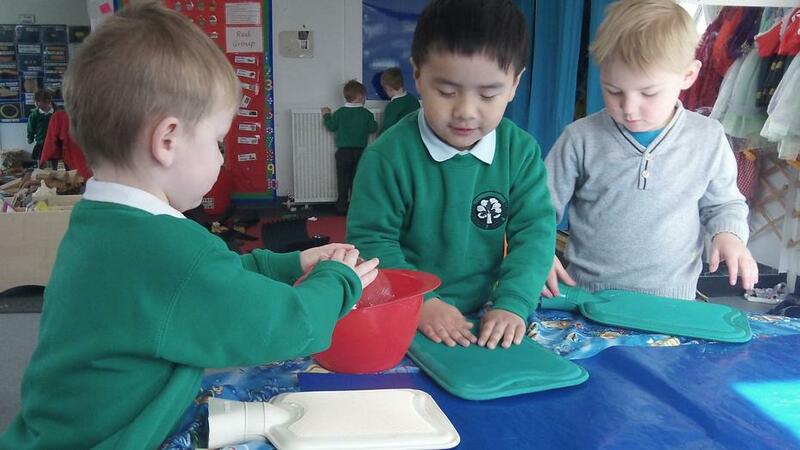 These felt warm. 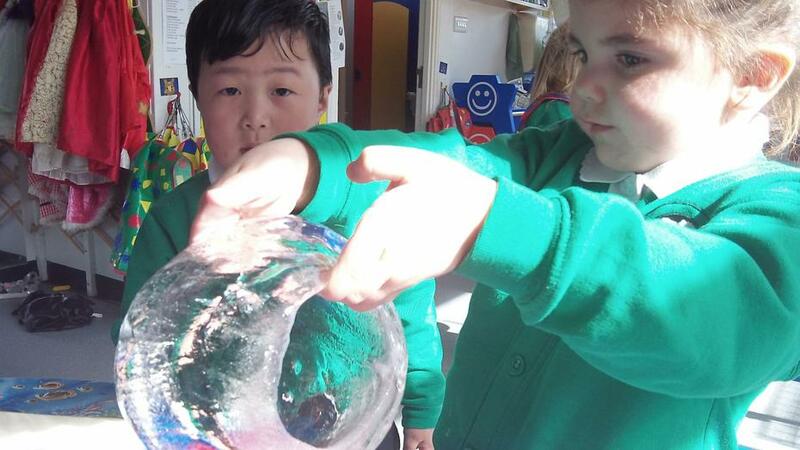 They noticed that ice feels “cold” and sometimes “dry and sticky” when “very cold” and then it gets “smooth and slippy”; ice floats, but only just, even though it is heavy; the ice balloon was “very heavy;” the ice balloon was “solid;” ice gets cracks in it when it is put in water and if you are very quiet you can hear cracking noises; ice can have air bubbles in it; ice melts but it is “very hard” and difficult to break; you can make ice melt faster by putting your warm hands against it. 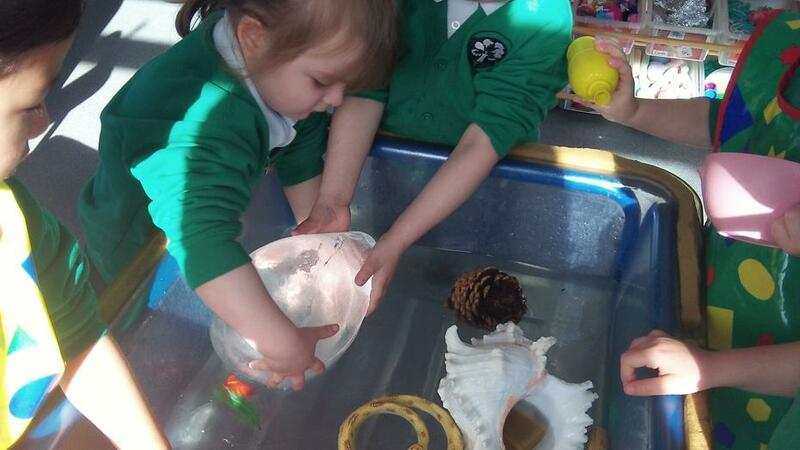 Your hands get wet. 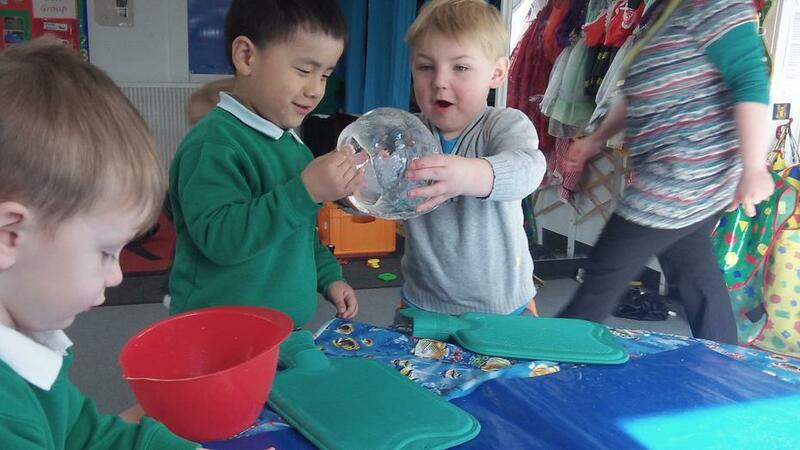 The ice balloon will melt even faster if you press the hot water bottle against it. 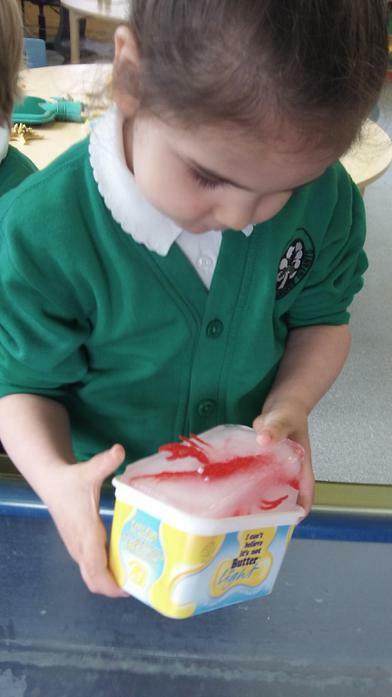 We froze objects in ice and provide substances such as salt, sugar and vinegar for the children to experiment with and see if it melted faster. 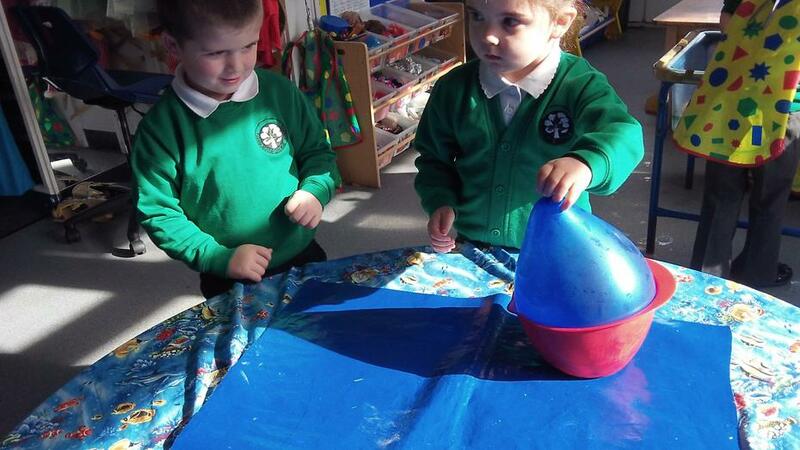 We found that if you put food colouring on the ice balloon it ran down the side. 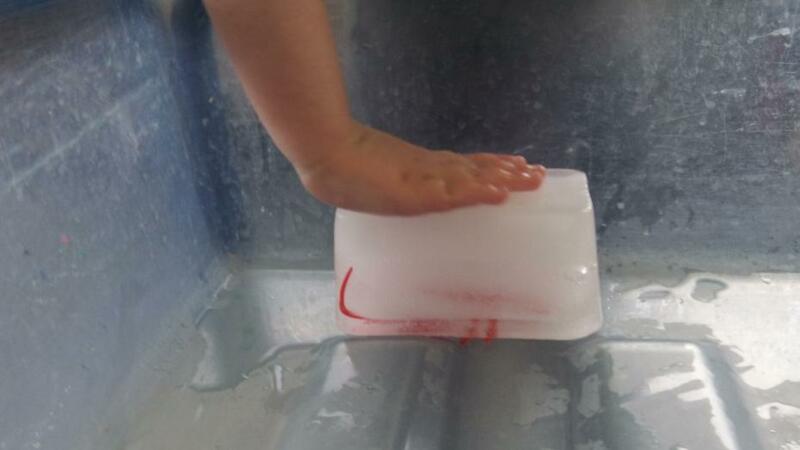 If you put salt on the top ice melted, the salt mixed with the melted ice and ran down the side. 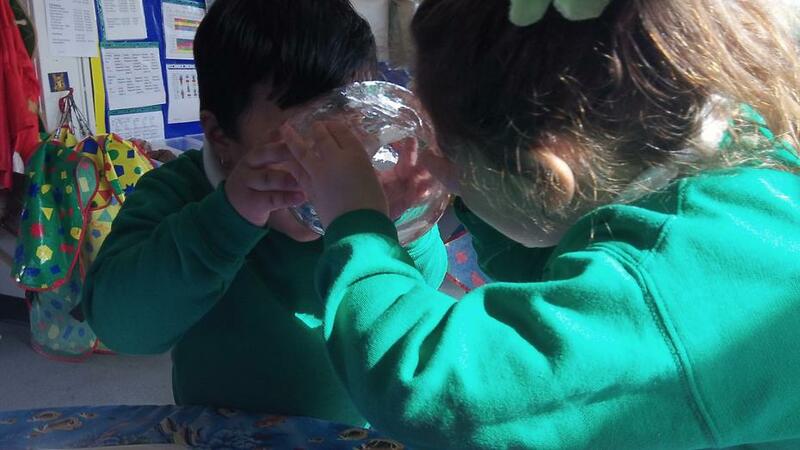 It made cuts in the surface. 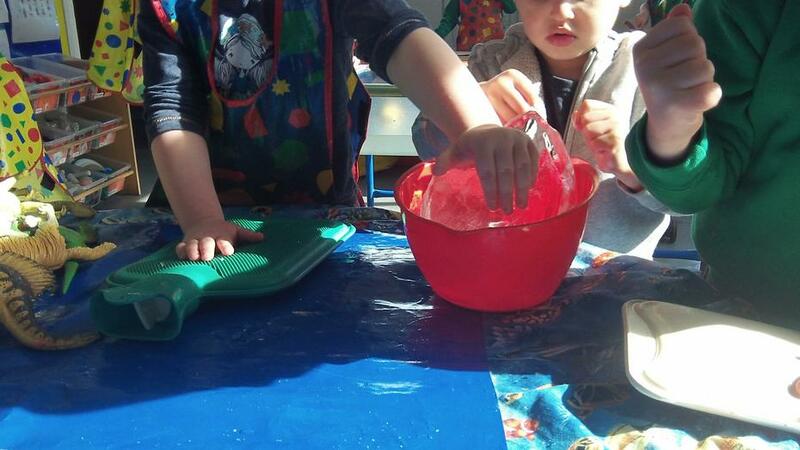 We had some messy fun by adding water to corn flour in a builder’s tray. 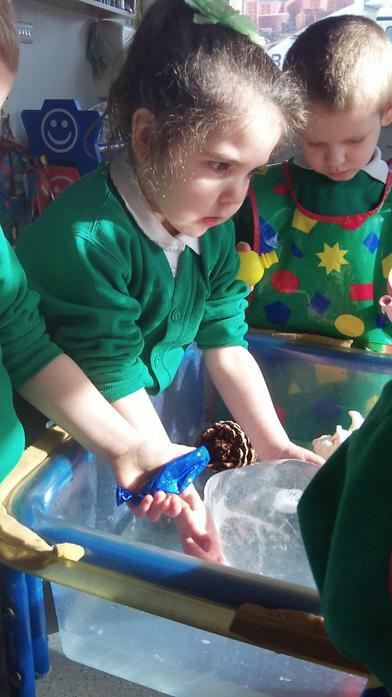 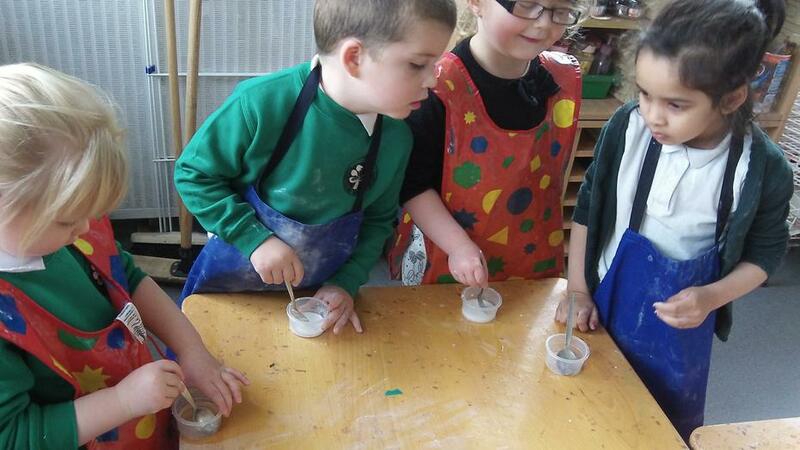 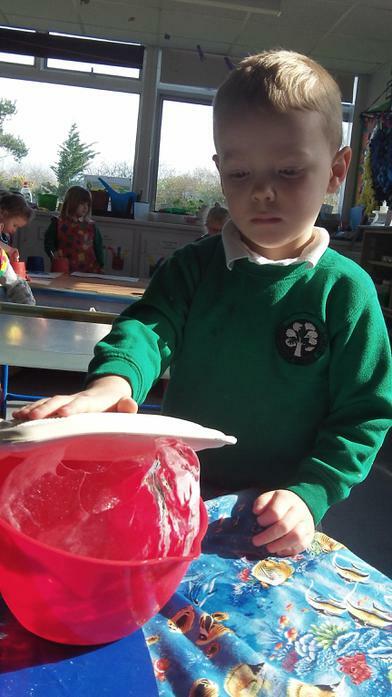 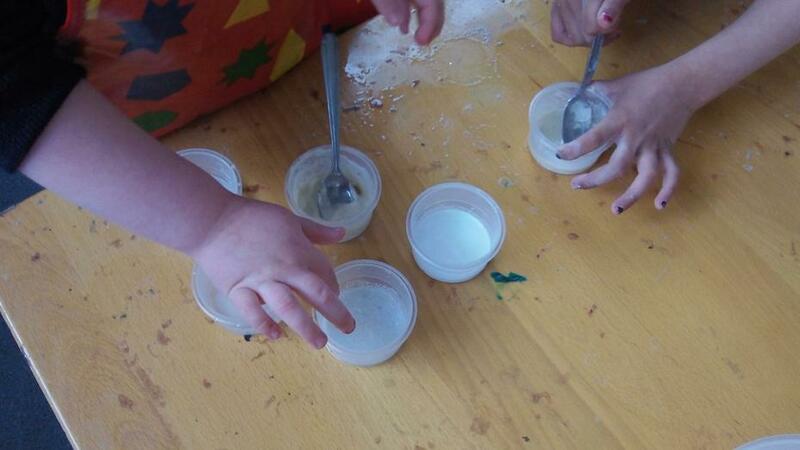 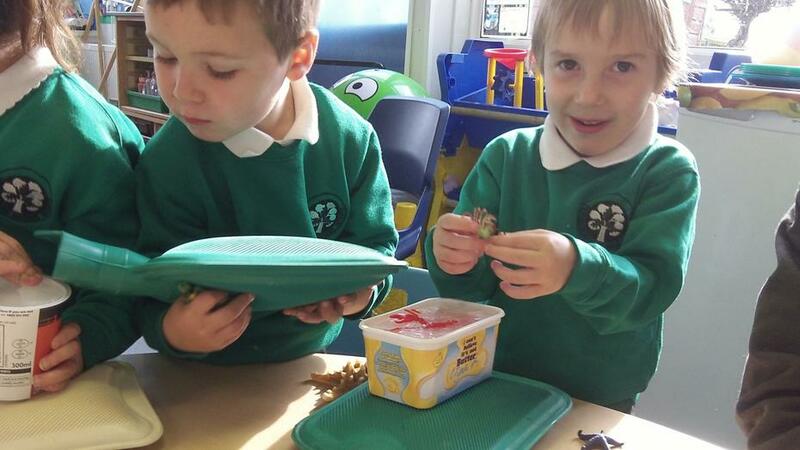 We encouraged the children to explore the corn flour by using their fingers and tools to scrape it up and let it go. 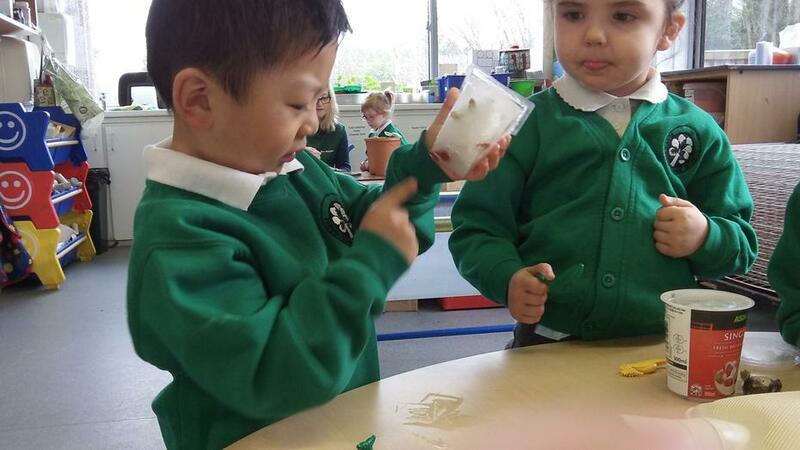 They noticed that the corn flour sets hard but turns runny when you scrape it. 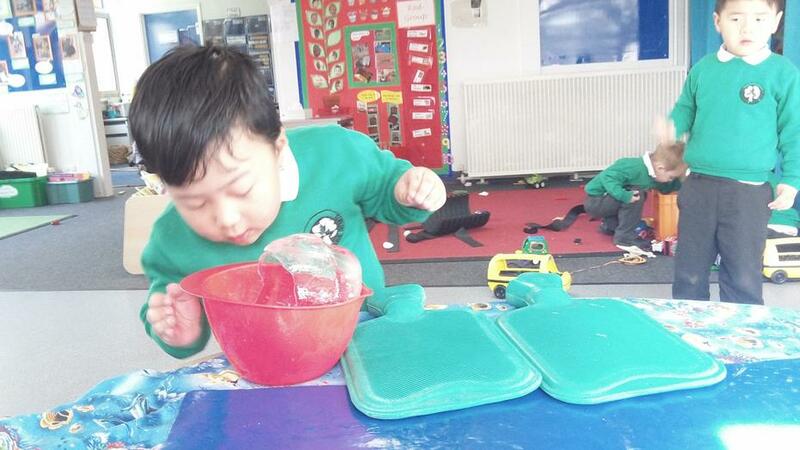 You can use tools to make marks in the hard corn flour. 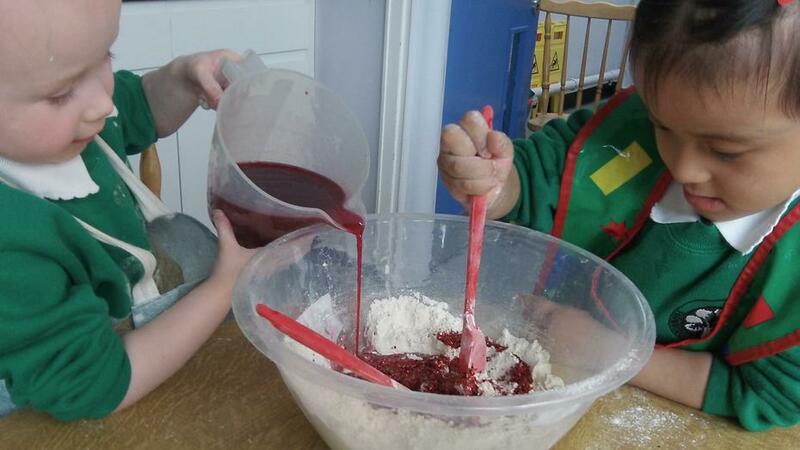 You can turn it from white to other colours by adding food colouring. 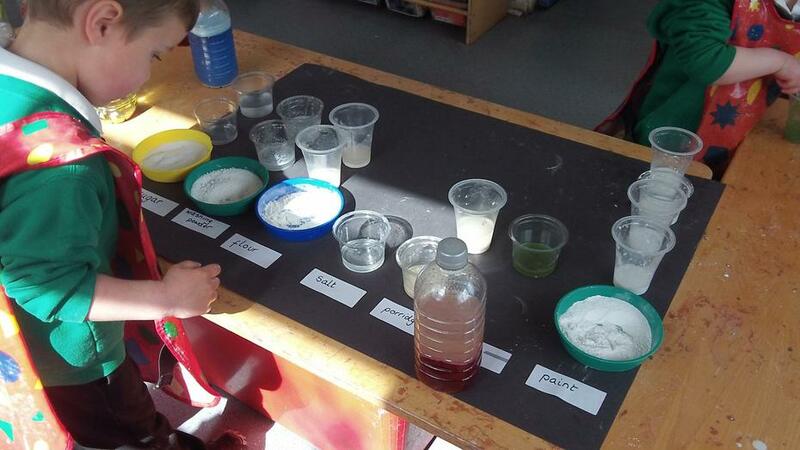 When you mix and cook different materials (flour, salt, water, cream of tartar and oil) you make play dough. 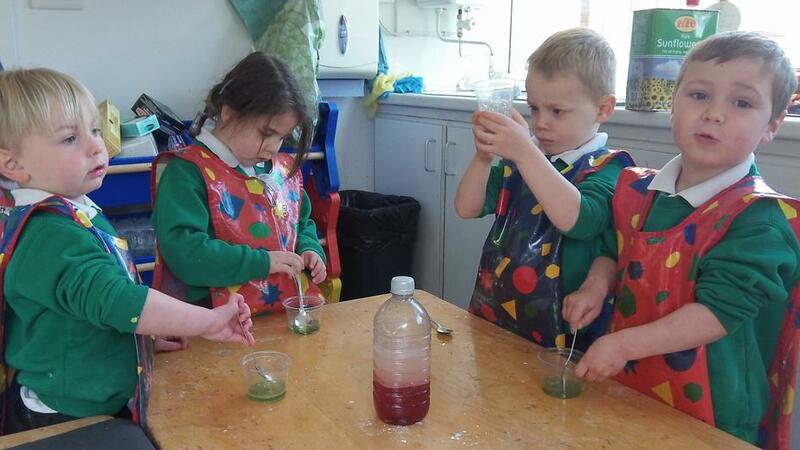 If you add food colouring, flavourings and glitter it looks fabulous. 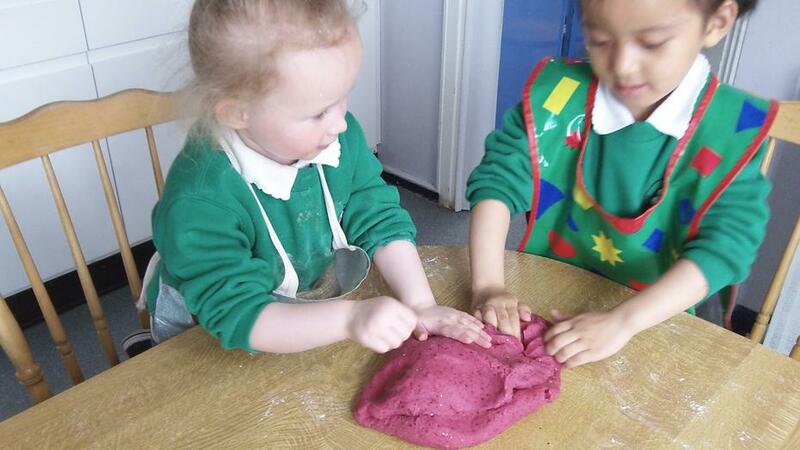 Children in Nursery are having a turn making our play dough and choosing what they would like it to look and smell like.